The Black Friday arrives and with it our offers in rentals of apartments Altea Dársena in Benidorm. Offer in apartments in first line of beach, in Levante Beach. On Friday 23 November we celebrate one of the best days of the year to find discounts on all that we need. This day is an excellent opportunity to enjoy a holiday of tranquility and relaxation overlooking the sea and with unbeatable offers. Take advantage of the exclusive promotions of Black Friday 2018 with Altea Dársena. We are talking about a day in which great offers and important discounts are launched to travel and to enjoy the great offers out of house. Travel is one of the great pleasures of life and these offers are sure to be a motivation for all those who want to take a few days off from rest and relaxation in front of the sea breeze. Travel is one of the most requested categories, so do not hesitate to visit us and consult our great offers to enjoy a unique and unmatched Black Friday in Benidorm. Altea Dársena offers you an irresistible holiday at an unbeatable price. Situated on the beach front, enjoying the spectacular sea views from your living room and terrace. 220€. Two adults with apartment, private parking and wifi hall. 260€. Two adults with 1 or 2 children with apartment, private parking and wifi hall. Apartments Altea Dársena as much as holiday apartments of up to 4 people, if that is your case, contact us and we will inform you of availability, prices, characteristics of the apartment … in itself, we will explain in detail to you so that you have your ideal apartment. In addition, we have extra beds in case you need them. Contact with Apartments Altea Dársena and we will inform you without any commitment. So, choose the apartment that you like best and that meets the requirements you were looking for. Take advantage of this date to book your days of disconnection and total entertainment with Altea Dársena, you can also book your stay through our forms provided on the web. In Benidorm you can enjoy the great offers in the large shopping centers of the city, as well as the tranquility of the sea on our incredible beaches or if you want, go out to disconnect or distract to our drinking areas and enjoy the unique atmosphere of Benidorm. Cheaper apartments with the Black Friday promotion. In Altea Dársena we are also black friday. During this weekend the reservations that are made, in stays from November 15 to December 20 by this offer, will have a discount. During this month, all bookings made until December 15 at 00.00 hours, and that are made through the forms provided on the web, putting the concept black friday offer, will have a discount on the days you book with entry on November 15 until December 20. That is to say, booking in this period of time, you will be able to choose a stay included in the dates that we have indicated previously, and in this month a discount will be applied to you. indicate the application of this discount in the concept of the form, and to more days reserved more discounts. In addition, the more days you book, the more discount you will receive. Now, ask us about the Black Friday offer, now available and choose the time of your stay. Take advantage of the best offers in Altea Dársena. Holiday apartments in Benidorm with great discounts during your stay with the discount we apply for being Black-Friday. But where are these apartments? If you are worried about the quality of your holidays diminishing, you are in luck, in Altea Dársena Apartments we offer the same apartments, with the same characteristics as always and, of course, the same location. Holiday apartments on the first line of Playa de Levante, in Benidorm. Fully equipped and with spectacular sea views. In the section of our website “offer of the week” you will see the great offers for November, ask for your offer black-friday and you will apply the discount! 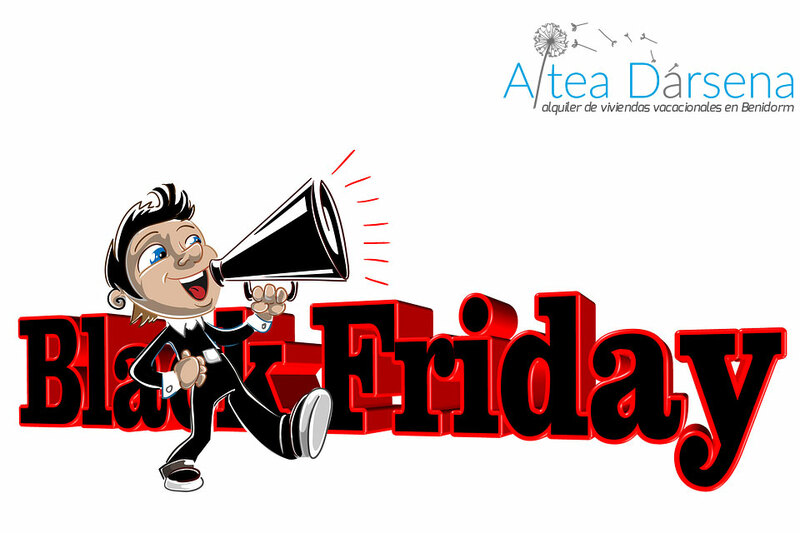 In Altea Dársena we join the black-friday and extend it, you will have great discounts not just one day or for a few hours. With us you now have the opportunity to spend a first class holiday at an incredible price – prices lower than ever! What are you waiting for? Don’t stay at home and make an escape at an unrepeatable price with Altea Dársena Apartments. Find your best offer, and consult us without obligation. Quality and good price in your holidays with Apartments Altea Dársena in Benidorm.